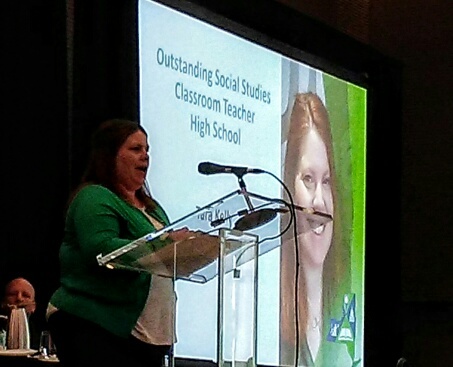 The New York State Council for the Social Studies presented the Outstanding Social Studies Classroom Teacher Award to Tara Kelly at their annual conference last weekend. Tara was nominated for the award by the Justice Resource Center in recognition of her “demonstrated exceptional teaching ability” in her Forest Hills classroom and with the JRC’s We the People workshops. Congratulations, Tara! Looking for a way to help JRC continue our law-related and civic education programs? The AmazonSmile Foundation will donate 0.5% of the price of eligible purchases to our charitable organization. Each time you shop online at Amazon.com, use our JRC link at: AmazonSmile Thank you for your support!